This memorable moment is a twofer, and probably the one nearest to my heart. We all (should) know that Death of the New Gods was a terrible story that did nothing but muck up continuity and convolute the lead-in to Final Crisis (while also having terrible grammar throughout the series). The last thing Final Crisis needed to be was more confusing. Those annoyances aside, the most tragic part of DotNG were the deaths of some particularly awesome New Gods, specifically … Knockout. Villains United was one of the first comics I read, and I was immediately smitten with Knockout. Her cavalier nature, all-out amorality, and general hotness made her pretty easy to love. Just ask Scandal. So to say she was sorely missed after her death is an understatement. Over the course of Secret Six, it really struck me when Scandal would miss her, too. She even went and got her a Knockout look-alike by the name of Liana … to fill the nonrefillable void. I was stoked when Knockout returned to the pages of Secret Six, but what was Scandal to do? She now loved Liana, too. Well, our darling Gail put the conventional in unconventional … and Scandal proposed to them both! Brilliant and beautiful. Jeannette’s perfect reaction put the icing on that polyamorous cake. I may have gotten a little teary-eyed. It was an immensely satisfying resolution. I had mixed feelings when I first read the final issue of Secret Six. I won’t lie, though. It was striking to see the Six on venom, going for gusto against the entire Justice League … and friends. Balls to the wall (and brains in their asses)! What do you expect? They are losers. Perfect, homicidal, sociopathic, hilarious, endearing, insane, loveable losers. 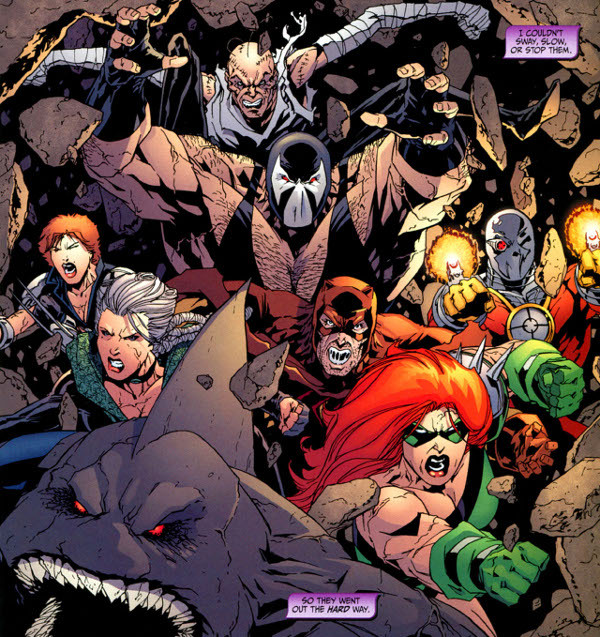 Here’s to the the awesomeness that was the Secret Six. To Gail and Jim, thanks for a stellar book, and making sure Knockout was there at the end. The Secret Six will be missed … very muchly. The Secret Six was amazing! I was so upset when it all ended. Without a doubt it was THE BEST comic book series DC has EVER published. I don’t remember reading a bad or mediocre issue. There was so much heart put into every single story line. GO GAIL SIMONE!!! !